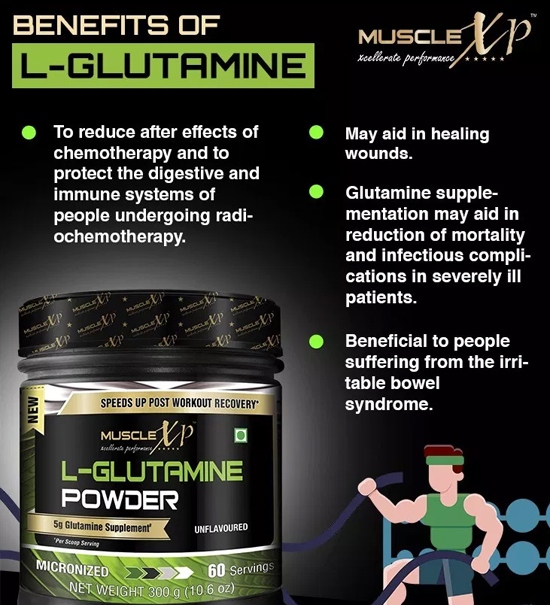 MuscleXP Micronized L-Glutamine powder helps support the muscle recovery. Amino acids are the building blocks for proteins and glutamine is an amino acid found naturally in the body. Glutamine helps the functioning of the gut, the immune system and also supports other essential body processes. Glutamine also provides fuel (nitrogen and carbon) to many different cells of the body. This is the fuel needed by the rapidly dividing cells of the immune system. Intense exercising regimens often result in depletion of the glutamine levels. This can cause immune impairment and increased susceptibility to infections. 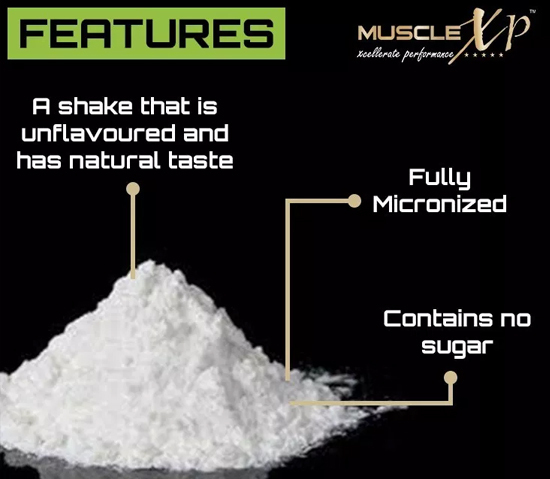 WHY MUSCLE XP MICRONIZED L-GLUTAMINE POWDER? There are various brands offering L-Glutamine powder in the market. So what makes the MuscleXP Micronized L-Glutamine powder special? Well to start with, MuscleXP is a name synonymous with quality and commitment. It has been manufactured keeping in mind the world-class international manufacturing standards. The L-glutamine powder has been micronized for better solubility and absorption. It is an unflavoured powder and gets easily mixed with a drink or shake. A LOT OF PEOPLE HAVE ADVISED TO STAY AWAY FROM L-GLUTAMINE SUPPLEMENTS, STATING THAT THEY HAVE MANY ADVERSE SIDE EFFECTS. SHOULD I BELIEVE THEM? As per variuos researches, L-Glutamine is a perfectly safe supplement. Any supplement consumed without proper information can prove dangerous. Adverse effects can be averted by consulting a doctor and following proper guidelines for consumption and dosage. IS THE MUSCLEXP MICRONIZED L-GLUTAMINE POWDER ONLY FOR BODYBUILDERS? No, for the number of benefits it offers, it is beneficial for almost everyone. You should consult a medical practitioner before the consumption of the product. L-glutamine is an important component of the bodybuilding diet. I’m taking this for a week with my favorite post workout drink. I prefer this as it does not contain added fillers or flavor. This is the perfect product I was looking for boosting my energy. It helps in improving exercise endurance. This product is helping me with my workouts. It is quite useful in relieving muscle soreness after exercises. An excellent product. This is providing me the extra energy. As this is unflavored, there is no after taste. A useful product for bodybuilders. It is of the best quality. Taking it for 3 weeks and it is working. This is good for maintenance and growth of muscle mass. It mixes well with post workout drinks. This is helping in reducing muscle soreness after workouts. I usually drink it straight mixed with water. It mixes well. A useful supplement for building muscles. Good quality. I am taking this supplement for muscle development. It dissolves well in water. I prefer taking this unflavored powder with post workout protein shake. This is an important amino acid for bodybuilding. Seems to be of very good quality. Blends quickly with protein and carbohydrate shakes. This supplement is known to help in muscle growth. Works best when combined with post workout shake. It dissolves fast. This product is an essential component of my bodybuilding diet. It blends easily with water and protein shakes. An essential supplement for bodybuilding. It dissolves easily in water and shakes. Good quality. An important supplement for muscle growth and strengthening the immune system. I take this with protein shake. Mixes easily. L-glutamine powder is an important supplement for increasing muscle mass. My fitness instructor recommended me this product. It works well. I am taking this for over a month. This is good for increasing muscle mass. Adding this to me post workout shake. This is an important supplement for muscle growth. The unflavored powder blends easily with my post workout shakes. Seems to be working for me. This is good for strengthening muscles and muscle growth. Dissolves quickly in protein shakes and plain water. L-glutamine is an important muscle-building supplement that my fitness instructor has recommended. This powder mixes quickly with milk/protein shake. The quality is good. Taking glutamine powder to boost the effect of endurance training. I think it is helping. As the powder is tasteless, it can be easily added to pre or post workout drinks, sports beverages, protein shakes or creatine powders. It can also be blended with water, milk or other calorie contributing ingredients. Mixing with low fat or non-fat milk gives the shake a thicker and creamier texture. It is advisable to start with lower quantities in the beginning and increase the dosage gradually.